As we are now fast approaching the 2018 Scottish salmon fishing season I've written a few paragraphs regarding my career based observations as to what the best salmon fishing tactics are for this early Spring cold water period from January through to mid March. The traditional River Tay opening day of the 15th of January is only a short burst of fishing tackle preparation away from being a reality. Personally I believe it's at least a couple of weeks too early to open a river as there's too many kelts and sometimes even unspawned salmon still in the Tay and a more sensible later opening date would be better for these fish to leave them alone until nature reclaims them or delivers them back to the sea. Our species I understand has to take preference and the traditional 'pomp' gains river PR and timeshare agreements have to be honoured so there's no point rocking the boat to show respect for our successfully spawned salmon kelts or fish that are still spawning. While that has always troubled me I did one year boycott a Tay opening day which both STV & the BBC covered simultaneously. I held an opening day on the Tay & invited our guests and we didn't fish and only celebrated which was a fantastic day to say the least! In stating the obove there are Spring salmon in the River Tay system right now and I've connected with them before in early December while out searching for hatchery broodstock. While the kelt to fresh Spring salmon ratio will probably be 100 to 1 given the eargerness of a hungry kelt to take a fly or lure the elusive Spring salmon is a true Scottish treasure if you're fortunate to make contact with one. On the Tay there's always a few taken on the opening day which is not surprising given the thousands of lures and flies that are being presented to the river. The reason I started off this news story stating that we are too early opening the Tay on the 15th is because for the half dozen Spring salmon we catch there's several hundred kelts hooked and played which really do not need the physical stress of that encounter as they're energy levels are already heavily depleated. Making too much sense to you fishery management geniuses but don't worry I'll lay off you for the time being as I know deep down you'll all know what I've stated here makes perfect logical river & stock husbandry sense and it's peer pressure and your 'pack mentality' that stops you from voicing these hard facts. Fishing in the very cold water is easy to understand and forget the super early start before the sun rises as these freezing conditions will shut a salmon down in to a state of non responsivess. 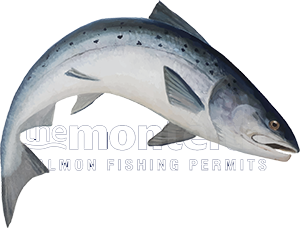 The kill zone for early Spring salmon fishing is primarlity between the hours of 11am & 2pm where there's usually a very subtle lift in the air temperature which is big news to a wild salmon. The books say deep in slow in the Spring but that's utter mince as any salmon will be holding high in the water column where the logical warmer water thermals are to be found until warmer conditions arrive. The traditional mid day lunch at 1pm should be moved back to 2pm if the early Spring ghillies and fishers are thinking about maximising their chances of success but many anglers are too accustomed to the 1pm rule. If you agree a 2pm lunch you're in effect increasing the fishing chances by 33% during the earely Spring fishing day's hot spot. Once the low positioned early Spring sun starts to dip again taking away that virtually un noticeable mid day warmth you're Spring fish will normallly go back into 'sleep mode'. A high in the water column fished fly that slowly swinging about one foot down will be the presentation that will stand you the best chance of a take. Many anglers would swear otherwise but none of them have anchored up a boat and had an angler swind lures and flies past them while wearing poloaroids to see exactly where these sunk lines are positioning a fly in the water column or how deep that 30 grm Toby 'Salmo' has indeed dug in. If you ever try this experiment in a pool with even a slow flow you'll see your sunkline & especially the largely uncontrolled & uncontrollable shooting heads type 2/3 are placing your fly only a foot or so down even though you'd assume you're fly is deeper. The other important thing to tune into while salmon fishing the bitterly cold early Spring weeks of the Scottish salmon fishing is to treat any & every knock on the fly with total suspicion. You may already have landed 6 kelts that morning and have self convinced yourself that there's no fresh Spring fish in the pools and let your gaurd drop. With every kelt you chance you're reducing the odds of contact with a Spring fish so stay focussed as the enevitable will happen if you fish well enough during these early Spring weeks. Don't get blazy with any take as the next nudge on your fly may be from a serious fresh run brute who's swum all the way home from Greenland to work out adrenalin gland!